The Perigee is 2.5 MB. Larger files take longer to load. This is the Perigee listing page, here you can download the plan, article and see the main thumbnail and extra images. Michigan's Tom Brett designed his pattern airplane, the 61 inch wingspan Perigee, after winning a place on the USA's 1962 FAI Pattern Team at the 1961 Philadelphia Nats. Analyzing the new FAI pattern requirements that placed more emphasis on vertical performance, Tom redesigned his previous aerobatic design, with the Perigee deliberately smaller and lighter, powered by a K&B 45RC glow motor. 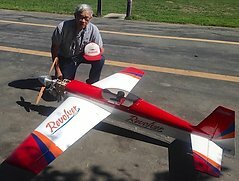 The changes were quite successful as Tom won the 1962 FAI Pattern World Championships with this plane, and flown on reeds no less! . In any case, the Perigee's distinctive design features include a sharply tapered wing planform with severe trailing edge sweep; tricycle landing gear; and a high-upswept rear fuselage placing the horizontal stabilizer a significant distance above the wing. The Perigee was briefly kitted by Harold DeBolt and is very competitive in Vintage Pattern/Aerobatic competitions today. Tom's original World Championship-winning model is displayed at the AMA's Museum in Muncie, Indiana. These are the details for the "Perigee" plan. If you would like to become a plan editor and help us to edit the attributes of all the plans in the website please click the "Edit Attributes" button below. Order your Perigee prints today! The Perigee plan can be printed on plain paper, tracing paper or polyester film and shipped worldwide. This tool allows you to calculate the cost of printing and shipping the Perigee plans and its building article if available. If you need to resize a plan please contact us with the ID:83241 and the desired wingspan. I will calculate a price upon request, please contact me here mentioning this PlanID: 83241 and the job you wish me to do. This plan is 2.5 MB and was shared by our member aeroastro on 04/04/2015 14:45 in the PDF Bitmap Wood Model Airplane Plans (1) category.